I want to share a short story about a boy who his fictional but is based on real life experience. Meet Ali, he is 10 years old, and lives in a big city in Denmark — in an area that most people would call a ghetto. Ali’s parents are from Pakistan. Ali likes to compete. He is a fast runner and hard hitter. He steals bikes and sometimes candy from the store. He is not that interested in school, even though he is rather smart and he could do well if he wanted. Ali has, what is called, a negative/destructive social network. His friends are older and they ask him for favors like “getting” chips and drinks for them. Ali does what they say because he appreciates the recognition and the feeling of meaning he gets when performing these tasks for the older boys. He becomes part of a group. One day the local sports club hangs a poster on the wall saying, “Red Star Sports Club, now offers esports and gaming activities – come check it out, and meet us”. Ali has never been in a sports club. He likes the streets were he feels safe and comfortable. On the other hand, Ali loves computer games. He plays FIFA and Counter Strike, with his friends and he is talented. When he plays, he often wins, and people usually want to be on his team if possible. He decides, with a few friends, to join the sports club and check out the esports activities they offer. A big friendly man at the entrance of the sports club greets them. Smiling, shaking Ali’s little hand, he says, “WELCOME little man, just go inside”. Ali smiles, he already likes the huge man. They all go inside and are guided to the esports room. Ali feels like he has been struck by lightning. He is amazed. The room is packed with people, talking, laughing, smiling and playing. The room has 20 gamer PC setups, 3 PlayStations and a huge television, streaming some of it. In the other end of the room there are a few couches and chairs for relaxing, hanging out or watching a movie. There is a meeting room, a strategy room and suddenly the huge man comes back, claps his hands loudly and yells, “EVERYBODY, LISTEN UP, HEY, LOOK AT ME”. The room becomes silent and he starts to talk. Ali is dazzled and a little distracted by all of the esport-equipment and people, so he doesn’t catch everything the huge man says. He does hear, though, that the club offers FIFA practice for kids 9-12 years old, Mondays and Wednesdays. That’s all Ali needed to know. As Ali and his friends walk home, happy and impressed by what they experienced, Ali says, “I am definitely going to see what their FIFA practice is all about”. The following Monday rolls along and Ali is not so sure about going anymore. Should he leave the streets where he feels safe and at home? Yes, he decides, at least he should try it. He already plays FIFA everyday, so what’s the worst that can happen? Ali laughs to himself as he walks to the club, dreaming about being the best in the club, beating everyone else. As Ali walks into the esports room he notices a few other boys who are there, and a young man, who immediately turns to Ali, gives him a big smile and says, “Welcome to Red Star FIFA practice, I am Mo, who are you?” Quietly and a bit shyly, Ali replies, “Ali”, Mo points towards the PlayStations, where five other boys are playing FIFA and says, “Great, we are expecting a few others and we start at 5pm. Go have a game with the others while we wait a few more minutes”. Ali walks slowly toward the other boys, when suddenly Mo yells, “Brian! Say hi to Ali!” A boy turns around, smiles, hands Ali a controller, and says, “Hi, I am Brian, this is Mohammed, Sali, Matt and Mark – are you any good? We need a good team in order to compete in the FIFA tournaments and league this year”. Ali feels welcomed and they start to play. Quickly he scores one, two, three goals, and wins the match. Brian high-fives Ali and says, “Well played Ali, nice!” Ali figures out that Mo is the coach. As the clock hits 5 pm, a few more guys enter and Mo closes the door. He gathers the nine boys in the conference room and starts to inform them about FIFA practice, and the FIFA division in Red Star Sports Club. Ali finds out that he needs to be a member of the sports club in order to be a member of the FIFA division. He has to practice every Monday and Wednesday and needs to stay out of trouble and take care of his schoolwork. The club works closely with the local schools, local government, social workers and police. And if the club finds out that any player is involved in any crime, drugs or is falling behind in school, they will take actions and possibly suspend the player from the club. Ali gets it — this (sports club) is a kind of reward he has to earn. Being number one drives Ali. He wants to be the best. The sports club offers practice hours, as well as the opportunity to participate in tournaments locally and in the national league. Ali discovers quickly that he is one of the best and Red Star is doing really well. They are even playing at bigger tournaments where they travel by a bus (that the sports club owns), and where Ali can play on a huge stage in front of – what looks like – hundreds of people. His friends back home notice that Ali is at the club more and more, and less and less on the streets and with them. They ask him why he is playing FIFA. It makes no sense to them, why not join them and go back to stealing bikes and candy. Ali is struggling personally. His friends are challenging his commitment to the esports club, school is hard, and his mom and dad do not want to pay for a membership in a sports club. Mo, the FIFA coach in the club, sees that and has a chat with Ali. Usually, Ali is not talking to anyone about his feelings, but with Mo it’s different. He respects Mo for his honesty and straightforwardness. Ali has never experienced anything else from him but respect and recognition. So Ali feels safe talking to Mo. It’s not like Mo has all the answers but he offers to talk to Ali’s teacher, so Ali can get a little more help in school. Also, Mo praises Ali for choosing the sports club over crime. As they speak, Mo realizes that Ali has made a few good friends in the club as well. So they agree to figure out if Ali could see Brian or Mohammed outside of practice at the club. Lastly, Mo informs Ali that the local government offers a grant that he can apply for, which will provide Ali with a free membership to the club. Ali feels like everything is falling into place. Amazing. As time goes by, Ali develops into one of the best FIFA players. He puts a lot of hours into the game and starts to jog for exercise, because it’s important to have a fit body and mind when doing esports. The story about Ali is based on many young kids I have met in Denmark over the last 15 years. The name could as well have been Michael, Sarah or Yusufa. 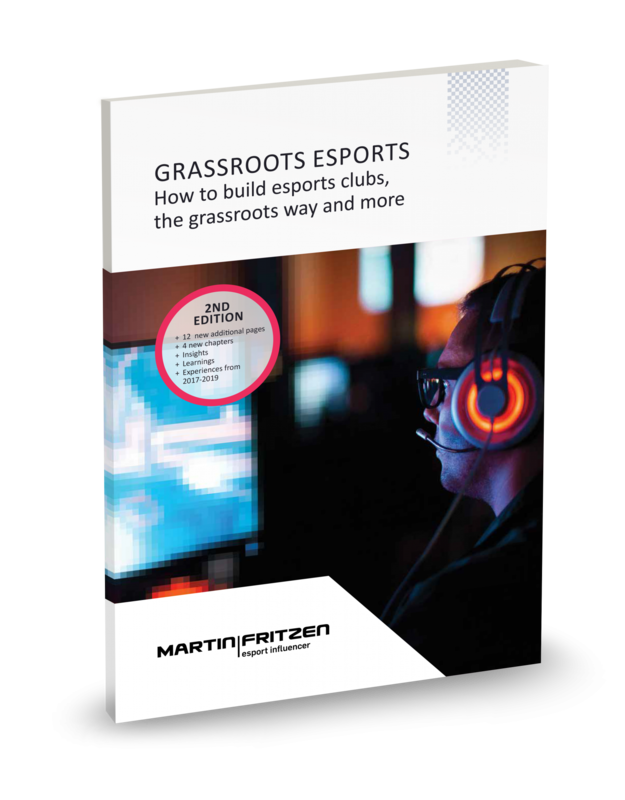 When sport clubs, schools, local governments and social workers work together, and form projects based around passion and interests (as esports are), we see certain hard-to-reach groups begin to interact and grow in a positive way. Unfortunately, a lot of gamers and players are being bullied, called names and teased for the fact that they game or “play on the computer” – even from their own family and friends. Esports, when well structured and organized, provides gamers a community, recognition, a feeling of self-worth and a sense of meaning. This can be crucial for a person’s personal development and in the end, a person’s feelings about living a meaningful life.